As an avid homebrewer, I read a decent number of books about beer. Like many Aleheads, Belgiain style beers are some of my favorites – especially the Trappist beers and abbey style ales. 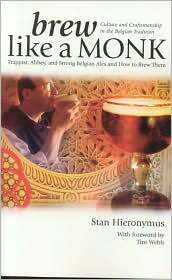 So it was with great excitement that I recently picked up a copy of Brew Like a Monk: Culture and Craftmanship in the Belgian Tradition, by Stan Hieronymus. Although I originally thought this would be a book specifically about how to make Belgian beers, it turned out to be quite a bit more than that. Many “how to” brewing books fall short in that they are simply a list of ingredients, recipes, or instructions. Brew Like a Monk goes above and beyond that, with the bulk of the book dealing with the history and culture of Belgian breweries. An emphasis is placed on the six Trappist breweries (Achel, Chimay, Orval, Rochefort, Westmalle, and Westvleteren). * Notable American breweries such as Ommegang and Allagash are covered later, as they are generally considered to be imitators (albeit those who now compete in terms of flavor and overall quality). 1. Brew your beer within an abbey that is a part of the Order of Cistercians of the Strict Observance (a Roman Catholic Order). 2. The brewery must depend on the monastic community. 3. The brewery must be run not for profit, but for assistance of the abbey and community. Hard to imagine something like that happening in the States! The book is also filled with all sorts of interesting facts about the Trappist breweries. For example, three of the Trappist breweries, Westmalle, Westvleteren and Achel, use Westmalle yeast to brew their beer. Despite this identical beginning, the different fermentation temperature and fermenter shape lead to three substantially different different beers. Another thing that surprised me was that Chimay uses hop extracts rather than fresh hops, something I’ve had trouble with in my own homebrewing (so there’s clearly some merit in it!). According to the famous brewer, Jean De Clerck, the extracts give more consistent control over bitterness in Chimay White. Brew Like a Monk is not written by a brewer: Hieronymus is more of a journalist who loves great beer. However, this isn’t a book for beginners: Brew Like a Monk is a highly detailed account, giving lots of in depth coverage of beer composition and origins. After a tour through the history of the Trappist breweries, other Belgian breweries, and Americans, Hieronymus goes into detail about how to replicate the flavor of a Trappist brew at home. While there are recipes included in the book, they are limited in number. Recipes are restricted to a few that match characteristic well known Belgian beers. An example is Vinnie Cilurzo’s Strong Golden Ale (comparable to Duvel, Damnation, PranQster, or Salvation). Despite the small number of recipes, Hieronymus does a fantastic job of describing the process of brewing a Belgian style beer, and truly enables the homebrewer to strike out on their own. This isn’t a book to rely on if you’re just brewing your first batch. But if you want to make your own beer in the style of Chimay, the depth and quality of information is fantastic. Helpful hints include tips from professional beer tasting judges and how to spot faults, among other useful tidbits. All in all, I found this book to be a fantastic read with loads of great information about the history, culture, and traditions of Belgian style brewing. It does a notable job of teaching you how to design your own Belgian style beer, whether you want to make an Abbey style ale, a dubbel, a strong, or even a blond. If you’re a true Alehead and are into more than just drinking beer – this book is for you. Highly recommended. *Koningshoeven, the “seventh” Trappist brewery, is also covered in the book, although they have had a history of conflict with the International Trappist Association, and have on occasion not been permitted to offer sanctioned Trappist products. Posted in Ale Factories, Alehouses, Beer Culture, Homebrewing. The Prof has been touting this book for awhile and I look forward to getting my hands on it and learning more about some of the best beers and brewers in the world. While I personally think that the US has become the finest beer-brewing nation on Earth (thanks to our unique mix of cultures and focus on innovation), no country has its national character as intrinsically tied to beer and brewing as Belgium. Thanks for edumacatin’ us, Prof.
I’d agree that the US is now in aggregate the best beer nation in the world, but it’s really hard to imagine American brewers truly surpassing some of those trappists. Having said that, some of those Ommegang brews (among others) are pretty outstanding. As a side note, I just learned that Ommegang is now owned by Duvel Moortgat, makers of Duvel. Seems appropriate. Although, in your defense, that post was written well before you joined our ranks. Sigh. I had always known that there was a Belgian connection and that the Ommegang founders were Belgian-trained, just never made the connection that it was Duvel. Mea culpa.